Federal Ammunition employee, competition shooter and brand ambassador Casey Reed won first place in the Limited 10 Division at the recent 2018 United States Practical Shooting Association (USPSA) Nationals, presented by Federal Ammunition. The competition was held in Polk County, Florida on October 20 to 28, 2018. 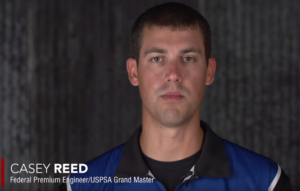 Reed is an employee of Federal Ammunition who works as a Handgun Product Development Engineer. At the USPSA Nationals, Reed took seventh place in the Stacked Production division. He then competed in the Limited 10 division. That first-place win crowned Reed as a 2018 National Champion. Interestingly, Reed used Syntech Action Pistol 9mm, 150-grain ammunition to secure the win which is the same product he works on as an engineer during his day job. Federal Premium offers Syntech Action Pistol in 9mm Luger, 40 S&W and 45 Auto. Designers configured the loads to meet the accuracy, reliability and power factor requirements of shooters who compete in the International Practice Shooting Confederation (IPSC) and United States Practical Shooting Association (USPSA). Syntech ammunition replaces standard copper jacketing with an exclusive polymer-encapsulated bullet. Its Total Synthetic Jacket (TSJ) prevents metal-on-metal contact between bullet and barrel, eliminating copper and lead fouling while reducing damaging heat and friction, thereby reducing cleaning chores and extending barrel life. Its heavy, flatter-nose bullets provide more reliable knock-downs on steel targets in competition and drastically reduce splash-back. The flat-nose bullet design also helps competitors produce better holes when shooting paper targets. In addition, Syntech Action Pistol uses clean-burning powders that minimize barrel residue, and its Catalyst lead-free primer provides consistent, reliable ignition. Federal Ammunition signed on as sponsor of the USPSA last year, and Syntech Action Pistol is the official sponsored ammo of the organization, with their logo on the box. Federal was also the title sponsor of this USPSA Nationals competition. Learn more about the USPSA at www.uspsa.org. For more information on Federal, visit www.federalpremium.com.